Every year there’s a new media storm about your child’s relationship with the computer. From promises that computer use at an early age will make your child a genius to the argument that Computer Games should be banned because they create encourage behaviour in users. So what is true and what is myth? 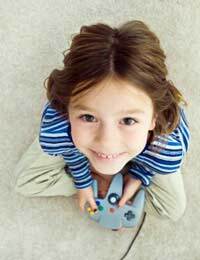 For years computer games have been lumped together as a negative influence on our children. The issue with computer games is in making sure that your child is playing a game appropriate for their age. When surveyed most young computer gamers claimed to have played adult games which, while not in themselves dangerous, could disturb a child leading to nightmares and insomnia. Studies have shown that computer games can have positive developmental benefits such as improved problem solving skills, better motor control and hand to eye coordination. There is also some evidence to suggest that games can help younger children to understand the concept of cause and effect. Excessive screen time (including TV and films) is bad for children it can lead to over stimulation, eye strain and potential computer addiction. However, when computer time is limited to around 2 hours per day there are no signs that computers have a detrimental effect on child users. Computer use should be seen as part of a balanced lifestyle for active children that includes physical activity and social interaction. One of the criticisms of children starting to use computers too early is that it is essentially a solitary activity and that children spend their early years learning to relate to other people. If their computer use is limited and they have regular interaction with other adults and children then computers are not bad for children. Laptops are smaller, lighter and more portable allowing your child to use them easily. However a laptop is not an ideal choice for a child because they cannot be set up with the screen and keyboard at the right height to encourage good posture. The correct set up is even more important for kids as they are still developing and their skeletons are more easily damaged. Aside from the health problems associated with laptops, a desktop with separate keyboard is a more sensible option for younger children because if they break the keyboard it can be easily replaced. If they break a laptop keyboard it’s not such a simple solution. Some studies have shown that children who have never used a computer before starting school will be at a slight disadvantage in computer based classes. However there is also evidence to suggest that starting children using a computer too young can be damaging. The consensus seems to be that three is a good age to introduce your child to the computer. Before this they’ll have limited understanding of what is happening, although they may enjoy pressing a key to see something happen on screen. Computer Geniuses are not created through early or enforced use but through development of an interest and aptitude.